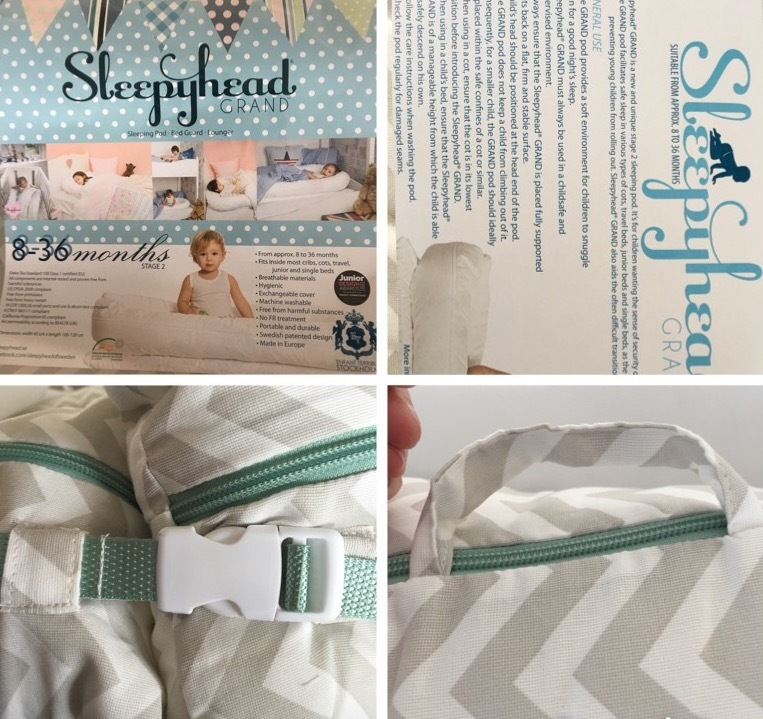 PaigeLouxox.com has been lucky enough to receive a Sleepyhead Grand bed guard ( in Chevron) to test and review. Jacob and His Sleepyhead Grand Pod in Chevron looking rather excited to try it out. as you all know last year I reviewed the Sleepyhead deluxe and i couldn’t contain my excitement when its larger ‘sibling’ arrived at my door. The Concept of this product is simple but it’s not to be undermined. The Sleepyhead Grand Retails at £149-£159 dependant on which cover you choose and is available from John Lewis and the Sleepyhead website direct,although the Sleepyhead website is currently being revamped and will be relaunched April 8th 2016 . The Sleepyhead Grand is suitable from eight to thirty-six months, so this was perfect for Jacob to try out at just twelve months. ‘The Sleepyhead Grand like its smaller sibling, is a patented award-winning Swedish design and innovation ( fully EU and U.S. Tested an approved.) The Sleepyhead sleeping pod is hygienic,it is anti dust mite and anti fungal with added antibacterial properties.The Sleepyhead Grand is designed with children’s safety at its core shown in its design which includes, a child safe buckle opening to create extra leg room to accommodate your forever growing child, a removable airflow mattress and bumper that is fully washable. The Sleepyhead Grand is also durable and lightweight meaning transportation is not a problem when using the carry handle that is attached to the pod. 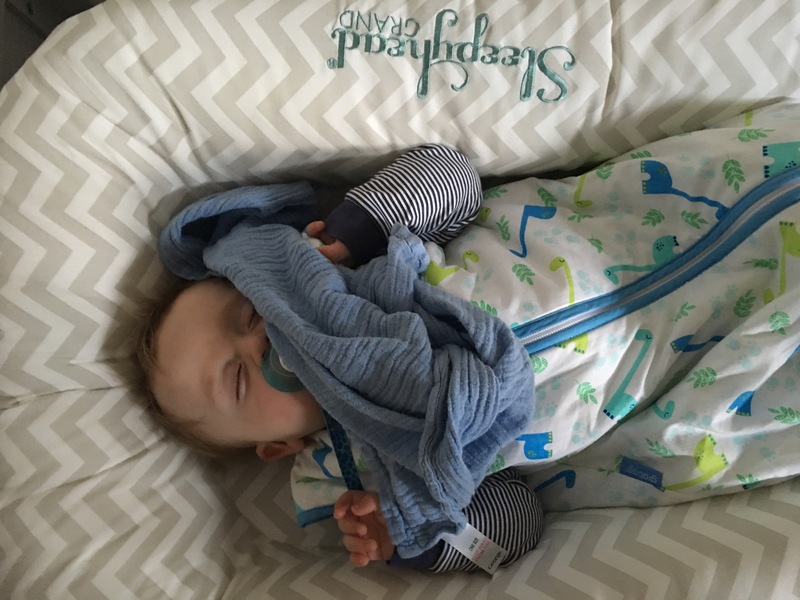 Now you may wonder how this is a cost-effective product for an older child of eight months so let me give you an insight into our Love for the Sleepyhead Grand. The main thing with any bedtime product is establishing a bedtime routine. In general a routine can take around a week to start becoming effective, stay with it and you will be glad you did. Now my personal experience with Jacob is that he wakes at night for the comfort of my arms to cuddle him, so in theory the Sleepyhead replaces my arms by snuggling him with the boarders of the pod. The first night we tested the Grand pod out he slept all night completely undisturbed. Over the past few nights he has started to figure out that I’m not actually in the room and he will stir, however by maintaining the routine i have full faith that the Sleepyhead Grand Pod will continue to be the Staple in our bedtime routine. Please click on the links inserted above if you would like to purchase, and if there are any particular questions you would like me to answer then feel free to comment below as always.